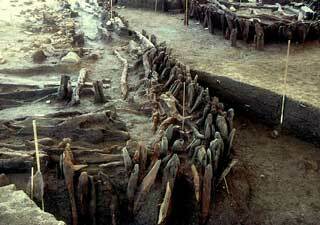 Uncovering the "Bronze Age Venice"
Naples and the adjacent area near Mt. Vesuvius are always the stage for conflict between antiquity and progress. Which do we need more, new metro stations so people can move around the city more easily, or those original Greek walls of the city now buried down there where those shiny new trains would like to run? You get various answers depending on whom you ask and how you phrase the question. I remember when they restored the grimy and weathered stone of the Aragonese Victory Arch over the entrance to the Angevin Fortress some years ago. The arch looked good when they finished it, and it managed to keep its new complexion, oh, for a number of days until it was defaced by eggshell grenades maliciously filled with red ink. The missiles were tossed not by random vandals, but by those making a political statement that the city spends too much on the past and not enough on the present. A similar conflict is being played out in the town of Poggiomarino, on the Sarno river, not far from Pompei. The Sarno river is, one reads, the most polluted river in Europe. That is staggering. What the area needs—besides a powerful environmental patron demon who kills polluters right on the spot—is a water purification facility placed at a strategic point far enough inland so that the populace between that point and Torre Annunziata on the coast no longer have to live on the banks of a toilet and such that the water that reaches the Mediterranean Sea is clean. Poggiomarino was to be the site for such a facility. Then, in October 2000, a significant archaeological discovery was made while construction of the new purification plant, itself, was underway. The site is already being called "little Venice" by archaeologists (in the same way, I suppose, as they refer to the prehistoric village in Nola as a "Bronze Age Pompeii" [click here]—maybe it helps drum up support). To wit: a 20–acre Bronze Age settlement, inhabited between 1700 and 700 b.c. Ancient engineers ingeniously drained a large swamp to their advantage, creating raised artificial islands of wooden pilings for their homes and using the waters of the Sarno river to feed a system of canals—which is where the "little Venice" part comes in. Hundreds of thousands of ceramic shards have been found, as well as hundreds of items of wood, bronze, glass, amber, iron, and wrought bone and animal horn. Such "pile-dwellings" are more commonly associated with the remains of primeval villages in the Alps and pre-Alpine regions. This one in Poggiomarino is the only example, thus far discovered, of such a settlement in southern Italy. Speculation is rampant: Who were they? Why did they leave? Were they pushed out by the early encroachers of Magna Grecia? Are these the people who moved a short distance away and built the settlement that would grow into Roman Pompeii some centuries later? The site is so significant that there is already talk of a Prehistory Park in the area. That is very ambitious. In any event, work on the water purification facility has stopped. It will have to be built elsewhere, but it certainly has to be built.